Last year, I spent a week celebrating some figures who sported some of the most interesting trousers in Joe history. I think it’s about time to break out the concept again, and so here we are. The Discovery Channel has Shark Week, and now Joe A Day has Nice Pants Week. Hopefully it will become a tradition, with parties and the like. Anyway, if you don’t remember the first year’s entires, the figures covered are in this link. Seeing that much of the US is in the midst of an incredible heat wave, I thought I’d focus the first entry on a Joe who’s dressed for a day out in the hot hot sun. It’s Shorts Wearin’ Alpine. He’s indicative of one of the attributes of the Valor vs Venom series. The line was ambitious in its ideas, but sometimes lacking in execution. There were quite a few remarkable redesigns and new characters, but proportion issues often sank the end product. Such is the case with Alpine. But I still manage to like the guy. Maybe it’s the Adventure People fan in me. Not content to simply rehash the classic Alpine uniform, the designers turned to a more civilian focus for the Joe team’s mountaineer. Gone is the heavy layered look of the 80’s figure, and in its place is a lighter, modern and mobile Alpine. Although the initial release of this mold presented him in rather pedestrian colors, this Tiger Force repaint got the colors a little closer to a military look. Figures of the era were often left lacking in accessories. Where the original 80’s Alpine included totally new specialized gear, this new version simply gets what seemed somewhat appropriate and available within existing tooling. In terms of climbing gear, that means a simple sculpted coil of rope and a grappling hook with string. A disappointment to be sure. Finally, the shorts. 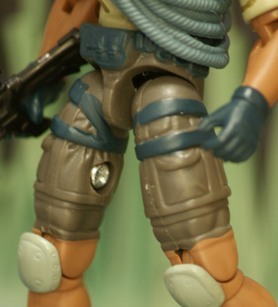 Is it acceptable for a GI Joe figure to wear shorts? I think so, given the proper situation, and especially in an outdoorsy situation. What’s more outdoorsy than climbing up a mountain? Though this figure may be a little too civilian for some collectors’ tastes, I find it a nice change from the expected. He’s odd looking, but looking past the proportions, I think the new look fit the character. After all, the original Alpine was off the beaten path as well. I say more power to you, Albert M. Pine, and by the way–nice pants. He looks like a UPS worker. Put a parcel in his hands, and I’d swear I’d seen him delivering packages at the mall! LOL! Hey he DOES look like the UPS guy. Rob, you need to custom up a box for him to deliver to a Playmobil house. In honor of “Nice Pants Week” I’m surprised you didn’t go with the first version…with the yellow shirt and reddish shorts. Nothing says “elite special missions force” like bright primary colors. All kidding aside, I do enjoy this figure (though I only have the yellow and red version). I think the update works for him since I always viewed the other Alpine as a little too over-insulated for non-arctic mountain climbing missions. I do wish he had more character specific accessories, but I just welcome an old throwback like him Valor Vs Venom was pretty heavily focused on the super popular main characters by the time he came out. They should have done a three-pack in USPS, UPS, and FedEx colors. The shorts do ramp up his toughness factor, especially if he takes on Everest. Is it “Nice Pants” week already?!? We are going to have to have an extravaganza this time around, none of that small-change hootenanny rubbish! Rock this week out, Rob! this just made my crappy work day 1000 times more bearable. I like this version of Alpine! Even though he’s got the beard and cap, it’s a bit tough for me to place him as Alpine without the goggles. I always imagined them as prescription, since he wore them everywhere he went.